Pictured left to right: WTC Chair Gregory Parker, Stuart Gosswein, John Healy, Myles Kovacs, WTC Chair-Elect Tyson Boyer during an insightful discussion panel. Members of the Wheel & Tire Council (WTC) were treated to several segment-specific activities throughout the week of the 2018 SEMA Show, beginning with a general membership meeting held on Monday, October 29. The well-attended session, which was built around the theme of “Tariffs, Technology and Trends,” was emceed by WTC Chair Greg Parker. Panelists included Tyson Boyer, WTC chair-elect and Cross-Council Technology Taskforce member; Stuart Gosswein, SEMA senior director of government affairs; Myles Kovacs, CEO/founder of DUB properties; John Healy, managing director of Northcoast Research Holdings; and Brian Paik, SEMA wheel and tire segment sales director. At the conclusion of the meeting, Parker thanked the panelists for sharing valuable tips and information and tipped his hat to attendees and panelists for helping to make it a successful event. 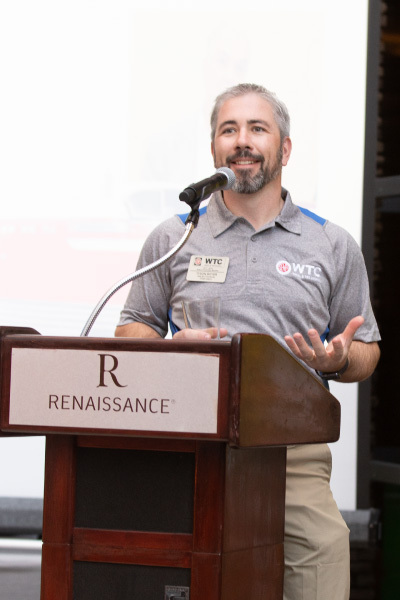 WTC Chair-Elect Tyson Boyer spoke at the WTC Reception. With tariffs a hot topic throughout the aftermarket industry, WTC continued its in-depth coverage with a seminar titled “Legal and Regulatory: Navigating the World of Import Tariffs.” The Wednesday-afternoon session offered a status review of tariffs on steel and aluminum, Chinese products and imported auto parts, along with renegotiation of the North American Free Trade Accord (NAFTA). Panelists included Laura Farhang, trade attorney with the firm of Picard Kentz and Rowe; Dan Ingber, SEMA managing director for government and legal affairs; Stuart Gosswein, SEMA senior director of government affairs; and Mayur Patel of counsel Quinn Emanuel and former associate general counsel for the office of the U.S Trade Representative. Pictured left to right: Chris Kersting, Wade Kawasaki, WTC Chair-Elect Tyson Boyer and WTC Chair Gregory Parker during the WTC Reception at the Renaissance Hotel. WTC members also took time out to celebrate the industry and its leaders and to connect with one another. On Tuesday evening, the council hosted another well-attended awards reception, this one celebrating the group’s 20th anniversary. SEMA President and CEO Chris Kersting and Chairman of the Board Wade Kawasaki of Coker Tire were on hand to present a cake in commemoration of the milestone. WTC Chair Greg Parker then took the stage to emcee the awards presentation. A special moment occurred later in the evening when Ryan Williams, son of the late Wayne Williams, accepted the WTC Hall of Fame honor on behalf of his father. With Wayne’s wife Tia in the audience and the younger Williams fighting through his acceptance speech, there was nary a dry eye in the house. WTC wrapped up the week on a high note with its Coffee & Conversation gathering, held early on Thursday morning. 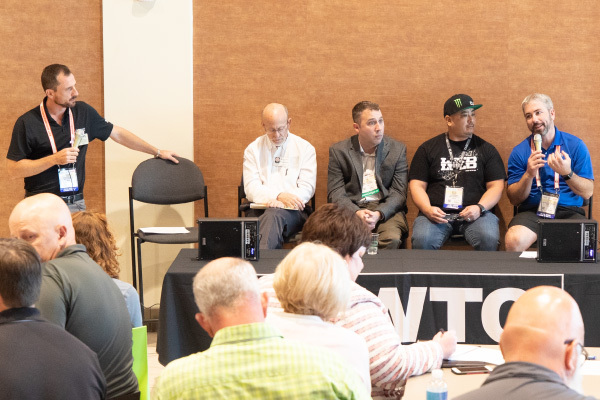 With more than 100 individuals from the Global Tire Expo in attendance, the low-key event allowed attendees to discuss a wide range of topics and was a fitting ending to a successful slate of council-hosted events.